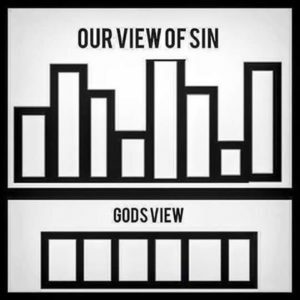 1) The graphic represents a differing view of sin by humans and God. We treat some sins worse than others. 3) The Church’s (Christians) defense and response to these prominent ‘sins’ and ‘hot button issues’ is often poor, harsh, and ‘simple’. 4) The result of these poor responses is a watching world that wants nothing to do with ‘religion’, Christianity, or Christians. 5) Fix this tarnished image by slowing down, seeking wisdom, speaking in love, and formulating your own defenses – not always regurgitating your favorite authors/pastors/theologians words. The graphic above is a nice simple illustration of, what I believe, is the Bible’s word on ‘sin’. The Bible does speak more about some sins than others; sometimes harshly. It warns of certain sins more. It speaks about sexual sin as different from other sin because it’s against your body. Let’s not dive into a theological debate of whether every sin is truly the same in God’s eyes. I do believe that this ‘it’s all the same in God’s eyes’ idea expressed in that graphic is not a free-pass to allow apathy to consume our response to our sin. There are real consequences to sin – all sin. Death. Everyone has sinned. It’s in our nature. Without Christ, we are dead in our sins. The graphic can be a helpful reminder in dealing with our sin to know that, while sin should be recognized, repented of, and suffocated from our lives, we all have forgiveness, restoration and hope – regardless of what sin we have committed. The graphic is also helpful in showing us how to deal with other people’s sins. We may occasionally forget that we aren’t the judge of another human. God is the ultimate judge. Sure, walk along side of, and correct, a brother or sister, but don’t be like the scribes and Pharisees who were ready to stone the adulteress woman. Sin equality within the Church? The graphic, quite literally, is a picture of a ‘level’ surface. I question, though, if the Church really lives this ‘level playing field’ view out. Whether intentional or not, from what I observe, it seems that the “Church” has elevated what they believe to be sins or wrongdoings above all other sins. I see this manifested in the amount of resources, time, energy, and attention they invest in taking their message on specific topics into the public spotlight – not dealing with sin on a personal level, but denouncing what they believe to be a ‘sin’ (and by association, the sinner) in the public square. Their focus is so narrow that they seem to neglect the other sin happening all around them – even in their Churches. I’m purposely putting ‘sins’ in quotes as what some in the Church deem as sin. At least in this post, I’m trying to separate my personally held beliefs from the points I’m making about the Church. Yikes, I hope that’s ok! I’m just not ready for a public debate on some of these topics because I have my own questions that I’m wrestling with as I seek to determine my stance on some of these issues. The subjects of abortion and [committed] homosexuality/gay marriage immediately come to mind. I understand that the Church’s stance on these subjects are being fiercely defended and advocated because they are such prominent social and legal issues in our culture today. Some in the Church are taking a strong stance in opposition on these issues because they believe they are called to counter the popular culture with their view of the truths contained in Scripture. I can certainly respect that. Where my ‘gut’ tells me there is an issue is in the response of some of those people. We have to remind ourselves how incredibly deep and complicated these issues are. Honestly, I’m frustrated. I see so many posts, shares, and ‘likes’ on any articles that talk about abortion (Hobby Lobby comes to mind) or homosexuality and gay marriage. I hear the same simple defenses repeated by people from a blurb they’ve read in an article or from a Fox News 30 second bit. It’s easy to share and like things that ‘seem true’ and that everyone else in your evangelical community is sharing. Doing this propagates a specific agenda and idea. I question, and challenge, whether those people have truly wrestled with a difficult subject that involves real people, real hearts, and real eternity. There are too many people falling into self-harm, depression, and suicide because we are perpetuating a potentially poorly reflected response rather than responding with with deep contemplation, prayer, love and a consistent message of hope and healing. 3) Be able to articulate your stance beyond “because this is what so-and-so believes” or “so many other people take this stance”. The heart might be there (somewhere down there) but the message that the world sees is terribly muddled. We need less “Facebook shares” and public passing-comments of narrow-minded and “simple” thoughts and more personal sharing, prayer, and dialogue amongst ourselves. Two other things trouble me with Christians exhausting so much energy on these two specific topics. First, all this protest and wild support of these two issues is happening while, within the walls of the Church and Church community, there are children being sexually abused, abuse victims being hushed or ‘counciled’ by those in charge (instead of going to the police), couples divorcing at a rapid rate, gossip abounding, elitism (aka not being humble), dissension/division splitting Churches and groups and pitting members against each other and staff, idol worshiping (mega church pastors, prominent people/pastors/authors in the Evangelical community being put on a pedestal), and people struggling on their own who aren’t being cared for properly because the Church has become just like a movie theater where people go to watch a sermon and sing some songs but don’t actually invest and care about each other. We are distracted. It all seems very hypocritical. As Christians, we know the world is broken, Churches aren’t perfect, and only God’s plan for redemption can fix this mess. But I think we can, and should, do better in presenting Christ’s message to the World. The Gospel isn’t a message about gay marriage or abortion. Jesus didn’t die on the Cross for those topics to define his people. I think we’ve failed if the only takeaway the world gets from Christians is that we believe this or that about abortion or gay marriage. The Gospel is so much more than that. It’s life-giving truth! It’s so good! My second concern is that much of the amazing servant work that the Church and it’s members are doing is being overlooked by the world because it’s being overshadowed by the few causes that the Church seems to be defined by. Defined by the world, perhaps – but only because that is what we seem to vehemently support. The poor and marginalized in our society are being cared for. People in the DRC are receiving free surgeries aboard Mercy Ships and returning to their hometowns no longer sick and shunned. On faith, Christians are moving their families into our Nation’s cities, bridging the cultural gap that has been divided by race and socioeconomic status, and creating relationships to clearly share the Gospel message. The homeless are being provided shelter, food, clothing, healthcare, education, training, and jobs. Women and children trapped in trafficking are being rescued. They are gaining voices and advocates. People are fighting for their rights and dignity. Children, both locally and abroad, are being adopted into ‘forever families’. Clean drinking water is being provided by newly built well systems in villages in other countries. Sustainable agriculture is being introduced to farmers in other countries so that they can farm better to provide for their communities. Teens who feel hopeless and have fallen into self-harm are being saved – physically, emotionally, and spiritually. The lost are being intentionally pursued and poured into and relationships, marriages, and lives are being restored. The Church is doing the amazing work of Christ ALL OVER THE WORLD. But do the venomous commenters on social media and news articles know this? The message portrayed in the media is that “Christians hate gays and don’t want women to have rights to their uterus.” That is what being a Christian is in the eyes of way too many people. Is that fair? No. Is is true? No. That is not me. That is not the heart of my friends who fall into all of the service categories I’ve listed above. Yes, what God thinks about us is what matters for eternity. And no, we’re certainly not supposed to be doing good things for the approval of men. But I don’t think we’re allowing the Holy Spirit to move among us when we’re hostile to the world, when the world knows what we stand against but not for, and when we don’t use our minds (and our hearts) to wrestle with certain issues. Can you say, with a clear conscious, that you are standing behind ‘hot button issues’ because you’ve prayerfully studied the scriptures, begged God for clarity, and received that clarity? Or does your conscious tell you you’re just relying on what someone else, who has influence, wrote? If it’s the former; well then, reader, I thank God for that and pray for continued wisdom and faith. If it’s the latter, then I pray you’d beg for wisdom and discernment… and speak slowly. …Instead, the heart of the wise thinks through their ways of doing life (Proverbs 4:26). It “ponders how to answer” (Proverbs 15:28) because it has come to learn that “there is a way that seems right to a man, but its end is the way of death” (Proverbs 14:12). Therefore the wise take a posture that examines, waits, listens, hears the best arguments, and gives time to search out what is presented without minimizing or exaggerating or denying it. Previous Post Same Grace. Different Look.